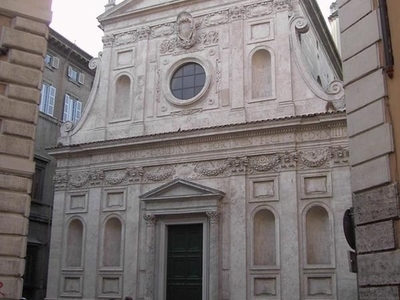 Santa Caterina dei Funari is a church in Rome in Italy, in the rione of Sant'Angelo. The church is mainly known for its façade and its interior with frescoes and paintings. The travertine façade shows the influence of other Renaissance churches on the Lombard architect Guidetto Guidetti. He relied much for his design on the design of the church Santo Spirito in Sassia, built by his teacher Antonio da Sangallo the Younger. The careful ornamentation contrasts sharply with the austere architectural arrangement in two sections. The sections are divided by pilasters with slightly modified Corinthian capitals. The lower section consists of five bays with three pilasters on each side of the entrance. Each space between two pilasters is filled with an empty semicircular niche under a festoon. Above and underneath each niche is a framed rectangular panel. The aedicular entrance is flanked by two Corinthian columns that support an architrave (with the text DIVAE CATHARINAE VIRG. ET MART.- St. Catharine, virgin and martyr) and a triangular pediment. The top of these two capitals are adorned with cornucopias and cherub's heads. The festoon over the pediment carries two iconographical symbols of martyrdom : a palmbranch and the sword, the instrument of her martyrdom. The other festoons contain a wheel, her intended instrument of martyrdom. The upper section consists of three bays flanked by a volute on each side. The middle bay is filled with a rose window inside a quadratic frame with roses on each corner. Above the rose window stands the escutcheon of the Cesi family between ornamental ribbons. The two other bays contain each an empty semicircular niche underneath a framed rectangular panel. The space between the capitals is filled with four ornamented oval cartouches. On top of the façade stands a triangular pediment with four acroteria in the form of a vase and in the middle an iron cross. This façade would become a model for the design of the façade of the Church of the Gesu by Giacomo della Porta. The church is built along an ground plan with a single nave, defined by half-columns with Corinthian capitals along the walls, with a vaulted ceiling and lunettes in the upper part. There are three semi-circular chapels on each side. The austere interior contrasts with a wealth of decorations executed by important artists from the late 16th and early 17th centuries. The altarpiece (1600) by Annibale Carracci in the chapel of Santa Margherita depicts the saint. He also painted the altarpiece "St. Barbara" in the first chapel on the right. The Ruiz chapel is the second chapel on the right side. Its altarpiece (a Deposition) was painted by Girolamo Muziano. Together with the third chapel on the right side, they were designed by Vignola but finished by Mascherino. The altarpiece in the third chapel (the Assumption of Mary) was painted by Scipione Pulzone . Federico Zuccari painted several presbytery decorations (with scenes from the live of St. Catherine) and a panel. Raffaellino da Reggio frescoed in the apse some monochrome friezes of putti and of the saints Romano, Agostino, Sisinio and Saturnino. The altarpiece above the main altar shows a "Glory of St. Catherine" by Livio Agresti. The altarpiece in the third chapel on the left depicts "The Story of S. Giovanni" by Marcello Venusti. Here's the our members favorite photos of "Churches in Rome". Upload your photo of Santa Caterina dei Funari!